Welcome to the Side Hustle Success Stories interview series where we chat with real people about real side hustles! Today, we learn about one side hustlers passion with photography. Marc from Vital Dollar presents his best tips on how to make money with photography. If you’re looking for a side hustle to make some extra money, one of the first things you should do is think about your hobbies and the things you enjoy doing. Photography is a hobby for millions of people. 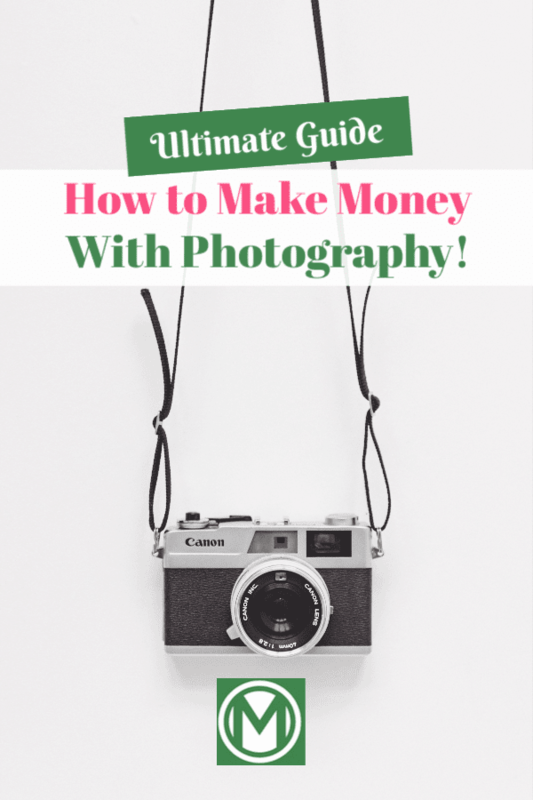 If you’re one of them, you may be wondering how you can make money with photography. The photography industry has changed in huge ways over a relatively short period of time, thanks to technology. Obviously, the transition from film to digital photography has been part of that. Along with digital photography, the quantity and quality of software (like Photoshop) has had an equal impact. The introduction of the iPhone and other smartphones, with increasingly capable cameras, has turned many more people into hobbyist photographers. The internet and social networks have greatly increased the potential reach and visibility for photographers. All of these changes mean that there are more people interested in photography now than ever before. That’s had some negative impacts on the industry. For example, many professionals have a harder time finding work because so many people have decent cameras and good enough skills that the pros aren’t always needed. Many companies who hired full-time photographers in the past now prefer to use freelancers. I know several excellent and experienced photographers that have jobs in other industries because making a full-time income as a photographer is hard. 3. The millions of hobbyist photographers who buy all kinds of products. I’m a hobbyist photographer myself, and about six years ago I decided to try to make some money from the hobby so I could spend more time doing it, and so I could justify paying for better quality gear. Although I’m not a professional, I was able to make more than $1,000,000 in the photography industry during the past six years. 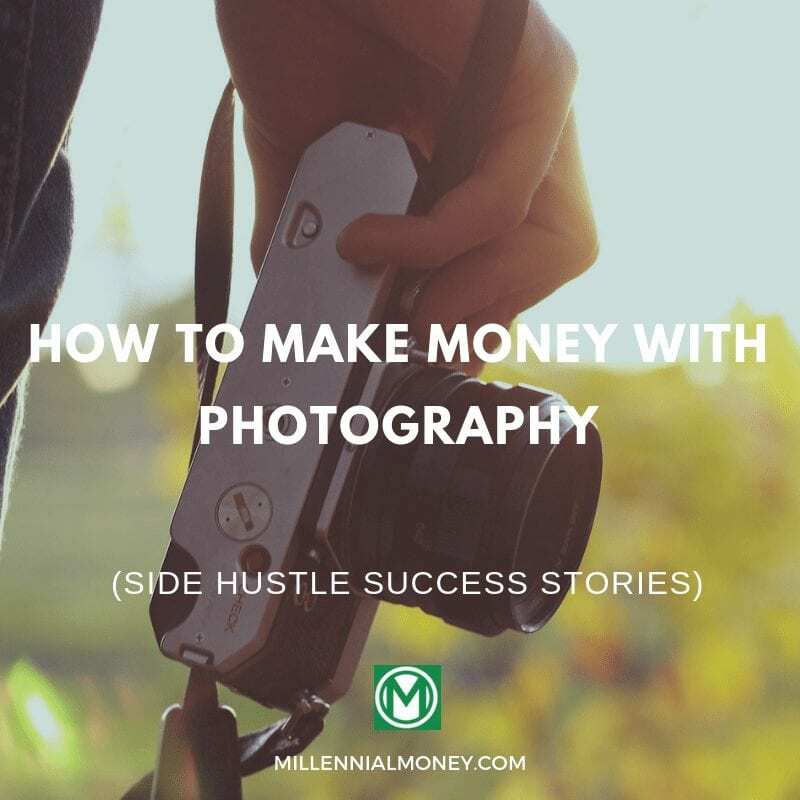 In this article, I’d like to cover some of the best ways to make money with photography. This isn’t an all-inclusive list, but it does cover the most popular methods, as well as those that should be of interest to anyone using photography as a side hustle. Ok, so you love photography and you love making money. But how can you go about making money using your photography, or at least working in the industry? Here are details of some of the options. Probably the most obvious and most common way to make money as a photographer is to work for clients. This often involves portraits. There are a lot of different types of photography and portraits, including engagement, maternity, newborn, family, seniors, fashion, and more. A lot of photographers specialize, and some do all kinds of different portraits. Specializing is obviously good for branding, which can be really effective in an industry that’s very competitive. While full-time professionals offer these types of services, there are many side-hustling part-time photographers that offer client sessions as well. Most photographers that offer client sessions have different packages that they offer to make it convenient for clients. For example, last month my wife and I paid a friend who has a photography side hustle for a family photo session at a local park. His package included a one-hour session and a CD with at least 50 photos for a flat fee. In order to get clients, it’s helpful if you have a place to showcase your photos online. This could be on your own website, and Facebook can also be helpful. After a client session, you can post some of the best photos to Facebook and tag the client (I’d recommend asking their permission first). Include a link to your site or your contact information and you may get business from the friends of your client. One of the more lucrative ways to make money in the industry is to photograph weddings. Wedding photo packages from a professional photographer are not cheap. If you’re a hobbyist and doing photography as a side hustle, there is a lot of opportunity here. You can charge a reasonable rate and still be a bargain compared to other photographers. My wife and I hired a part-time photographer for our wedding. She did a good job at a fraction of what we would have paid a professional, and she still made a good amount of money for a few hours of work. As a wedding photographer, you can also create packages that include additional things like engagement photo sessions, save-the-date cards, custom invitations, photo albums, and more. These options make it possible to make more money from each client that you land. Although wedding photography can be a great opportunity, there are definitely some things you’ll want to consider before jumping into it. You’re photographing the biggest day of your clients’ lives and some pressure comes with it. You only have one chance to get the photos right, so you need to know what you’re doing. You may have heard horror stories involving bad memory cards or other technical difficulties that ruin the day. In some cases, lawsuits have resulted from situations like this. Personally, I’d highly recommend that you get some experience in other forms of photography before attempting weddings. But weddings aren’t the only type of event that you can photograph. Bar mitzvahs, birthdays, corporate events, concerts, and other types of events present opportunities as well. There are a few different ways you can go about selling prints. If you’re taking portraits for clients you could offer packages that include specific numbers of photo prints in different sizes. Today, most clients will prefer to get the digital photos and have the right to print them whenever and wherever they choose. Some photographers charge a premium for clients to get the digital photos and the rights, and for other photographers it’s a standard practice. This is one area where I’ve seen most side-hustling photographers differ from most pros. Professionals tend to offer packages of prints or a higher priced package for the digital photos and the rights. Many side hustlers skip the prints and just give the client digital photos and the rights to print whatever they want. This is one way part-time photographers offer prices that are much lower than most professionals. You can make some money selling prints to your clients, but the average part-time photographer isn’t able to get a significant markup, so many decide that it’s easier just to offer a CD or DVD with the digital photos instead. The other option for selling prints is to take the approach of selling art. Many landscape and travel photographers make a portion of their income by selling prints either on their website or in person at flea markets and other events. Some photographers are also able to get their photos into art galleries. Landscape and fine art prints can sell for very good prices, so you don’t need to make a ton of sales in order for it to add up. There is a lot of competition since there are many, many talented landscape photographers. In my opinion, the best way to have success as a part-timer is to specialize in your local area and brand yourself. For example, if you live in Michigan you could brand yourself as a “Michigan landscape photographer” rather than a “landscape photographer”. You could even make it more specific and focus on the Upper Penninsula. Or, if you live near a national park or some other high-profile location, you could brand yourself around just that one location. Create a portfolio website and only include photos from the specific area that you are specializing in. Use keywords on your site like “Michigan”, “Upper Penninsula”, or whatever is appropriate. You can also use blog posts, a Facebook page, and an Instagram account to brand yourself. After a while, you may become known as a leading photographer in your area, and you’ll have a better chance to rank for Google searches like “photos of Michigan”. All of this can lead to sales of your photo prints from people who want photos from your area. The technical aspect of setting this up is not too difficult. You can create a website through companies like SmugMug and Zenfolio. Website visitors will be able to order prints right from your site, and they’ll ship from the print lab straight to the customer. If you’ve ever read any articles or blog posts about how to make money with photography, you’ve probably seen stock photography listed as an option. Many articles on side hustles or monetizing hobbies talk about stock photography as a great option. 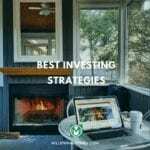 These articles usually make it seem like you can upload some of your photos to Deposit Photos, iStock, or other stock sites and start making passive income. In reality, making money with stock photography websites today is very difficult. There are plenty of photographers that do extremely well with stock photography sites, but most of them have been doing it for years and have massive portfolios that allow them to make a high volume of sales. Getting started today with stock photography websites is difficult because your photos are likely to get buried beneath the millions of other photos that are already selling. That doesn’t mean that it’s not an option you can or should pursue, but I want to be honest and realistic about the likelihood of actually making money with this method. The good thing about selling on stock photography sites is that is doesn’t need to take a lot of time. You’ll need to get approved by any marketplace where you want to sell, which usually involves uploading a few samples of your best photos. If you get approved, you’ll be able to upload more. 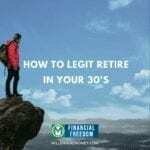 If you do want to pursue this, I highly recommend also trying some of the other money-making methods covered in this article. For most photographers, sales on stock photography sites may bring in a small amount of passive income, but it’s not usually a significant amount. If you do decide to pursue stock photography, be sure that you get a signed model release from any models in your photos (any decent stock photography site will require this). If you’re selling landscape or travel photos, you may need a property release. Aside from prints, there are plenty of items and products you can sell that feature your photos. A lot of these things will make you a fairly small profit per sale, but it can add up. My recommendation would be to use this in combination with other methods on this list, rather than relying on this method alone. Some of the options include calendars, postcards, magnets, mugs, and much more. Print labs like Bay Photo will offer some of these things, and print-on-demand sites like CafePress and Zazzle offer many products. One way to make money with photography without actually taking photos for clients or selling your photos is to start a photography blog, YouTube channel, or podcast. There are, of course, already a lot of photography blogs out there. But there are also millions of people who read photography blogs, and opportunity is still there. A number of well-established, popular photography blogs have been around for a long time. My suggestion would be to choose a specific niche or type of photography that you want to specialize in. You could start a blog on drone photography, travel photography, street photography, wildlife photography, landscape photography, sports photography, wedding photography, camera and lens reviews, post processing, or focus on specific gear or equipment. Specializing will give you a better chance to stand out, be memorable, and rank for searches related to your topic. See Grant’s article How to Start a Blog (& Make Money) for more guidance here. Building a successful blog requires time and dedication, but the long-term payoff can be huge. I’ve been blogging full-time for more than 10 years. It originally started as a side hustle and turned into a full-time income in about a year and a half. There are also a number of popular YouTube channels related to photography. Some of them are a part of a blog, and others standalone without a corresponding blog. You’ll find YouTube channels that focus on gear review, specific types of photography, and others that specialize in post processing with software like Photoshop and Lightroom. The popularity of photography-related YouTube channels seems to have really increased in the past few years. Photographers like Thomas Heaton have used the platform very well. Starting a podcast is another option. Although photography is obviously a very visual subject, there are a number of popular podcasts in the industry. As a podcaster, you would have the same monetization possibilities as a blogger (you could easily combine a blog and podcast if you wanted to). Because there are a lot of existing photography blogs, there is plenty of work available for freelance writers who want to write about photography. Many blogs hire freelance writers, and there are also magazines and other publications that pay writers. If you enjoy photography and writing, but you don’t want to start your own blog, freelance writing is a great opportunity. Even if you do start your own blog, freelancing can allow you to make some money while you’re working to grow your own blog. I’ve run a few photography blogs over the years and I’ve hired several different freelance writers. Most of them were hobbyist photographers who did photography on the side of a full-time job. If you want to land some freelance writing opportunities I would suggest starting your own blog so you can have some writing and photo samples to submit to other blogs when you’re looking for work. You may find some opportunities on freelance writing job boards, but a better approach would be to directly contact bloggers and editors about your interest in writing for them. Some blogs will have a “write for us” page with details about how to contact them. Others will not have that info on their site, but you can still reach out and express an interest in contributing. If you do travel or landscape photography you can also reach out to many different travel blogs about writing for them. Freelance writing is actually one of the best options on this list, in my opinion. One reason is because you can use it as a nice complement to many of the other methods of making money with photography. Depending on the blogs and publications that you’re writing for, you may gain valuable connections and build name recognition that can help you in a lot of other ways. Remember back in the intro of this article when I said that photography’s increase in popularity has opened up a lot of new possibilities and opportunities? Well, this is one of them. There are so many people today that are hobbyist photographers, and many of them are willing to pay to learn and improve their skills. The potential audience for photography educators has exploded in the past 5-10 years. Photographers today may face a lot more competition for client work, but the increase in the number of photographers has made it possible to make money in other ways. At one of my old photography blogs (I no longer own it), I used to interview photographers. It was pretty rare that I came across a photographer who had a formal education in photography or art. Most learned by reading books, taking online courses, a mentor, or just from lots of practice. There are many thousands of people who are paying for online training in photography. Many photographers have written books or ebooks, and a growing number are creating online courses. This is not the best money-making opportunity if you are new to photography, but for the right person, it can be an incredible opportunity. And with a little bit of creativity, there are some possibilities to create an ebook or course even if you’re not a pro. If you are somewhat new to photography but skilled with Photoshop, you could create a post processing ebook or course. You could also create a guidebook. Last year I traveled to Acadia National Park, and before the trip I bought an ebook that was a guide to all of the best spots to photograph throughout the park. I’ve also bought a book that covered the gear used for landscape photography. Those are just a few examples of the types of educational products you could create even if you’re not the world’s greatest photographer. Another option is to focus on improving your skills now and make money by doing client work or starting a blog, and later move on to ebooks or courses when you’re ready. You don’t need to be a professional photographer to create these types of products, and you actually don’t need to create them yourself. Outsourcing product creation is something that can be done easily with sites like Upwork. Most of the money I made in the photography industry was through the sales of digital products. I used blogs to attract traffic and grow email lists, which leads to sales. And I also sold my products on third-party sites like Creative Market and Etsy. Many photographers make money by hosting or leading photography tours and workshops. This is especially common with travel, landscape, and wildlife photography, but it can work with other specialties as well. With so many hobbyist photographers interested in improving their skills, there are plenty of people who are willing to pay for quality instruction. Some photo tours mostly involve a guide leading participants to subjects of interest, with relatively little instruction or teaching. Other workshops provide much more hands-on photography instruction and guidance. In addition to group tours or workshops, some photographers also offer one-on-one sessions. I’ve actually paid a professional photographer on two different occasions for one-on-one workshops. I loved the experience and it was well worth the money. If you live in an area that is known for beautiful scenery, this could be a great option. Many photographers also travel to other locations to lead workshops, although that probably is not the best option for a side hustle. This may seem like the sort of thing that would only be a possibility for full-time photographers, but I actually know a few people who have led tours and workshops while having full-time jobs in other industries. Before offering tours or workshops be sure that you have your legal bases covered. Have an attorney draft a waiver of liability for your clients to sign, and get any permits that are required. Some locations will require you to hold a permit in order to lead a commercial tour or workshop. Now that we’ve covered 10 different ways you can make money in the photography industry, it’s time to take some action. Think about the possibilities and see how to pros and cons match up with your own situation, your skills, and your long-term goals. Chances are, you may want to use a few of the different methods. My recommendation would be to start with just one, and then add another method after you’ve had some success with the first one. 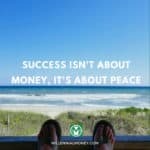 If you have any experience making money with photography please feel free to share your thoughts in the comments. Author Bio: Marc has been a full-time blogger since 2008 with blogs in industries like web design, photography, travel, and finance. 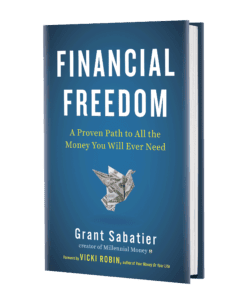 In 2018 he launched the personal finance blog Vital Dollar, where he writes about ways to save money and ways to make money.